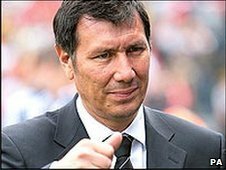 Former Northern Ireland manager Lawrie Sanchez has joined Barnet as a consultant as the club battle to avoid relegation from the Football League. Sanchez will offer his experience to Bees caretaker manager Giuliano Grazioli until the end of the season. The 51-year-old told the club website: "I've come in to help Giuliano who is a football acquaintance." Grazioli added: "This is a chance to learn from someone with experience at Premier and international level." The former Wycombe boss joins Grazioli at Barnet, who are in the relegation zone in League Two, following the departure of Martin Allen to Notts County.